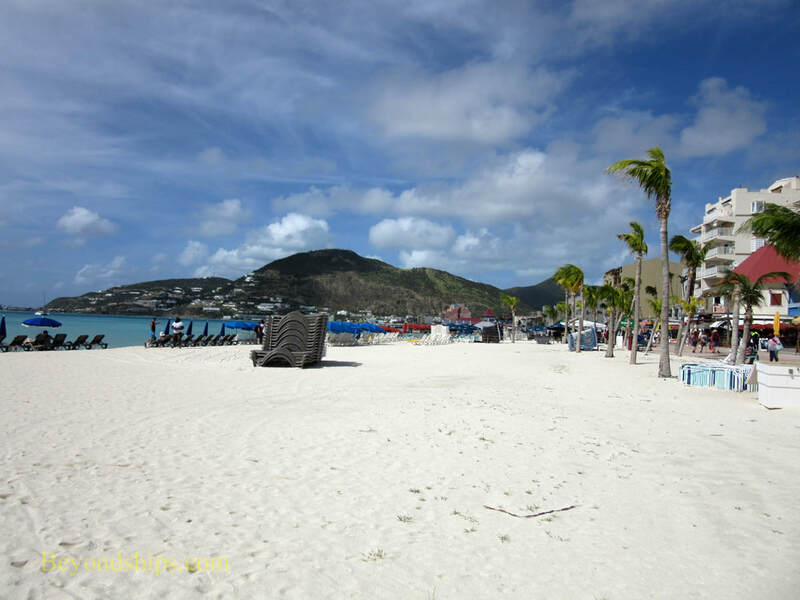 While the scientific accuracy of these observations may be questioned, even several moths after the 2017 hurricanes it is clear that the island of St. Maarten was hit hard. However, the island, which had had one of the best developed tourist infastructures in the Caribbean , has bounced back. Perhaps the island is not up to where it was pre-hurricanes but it is already providing a good cruise destination experience. 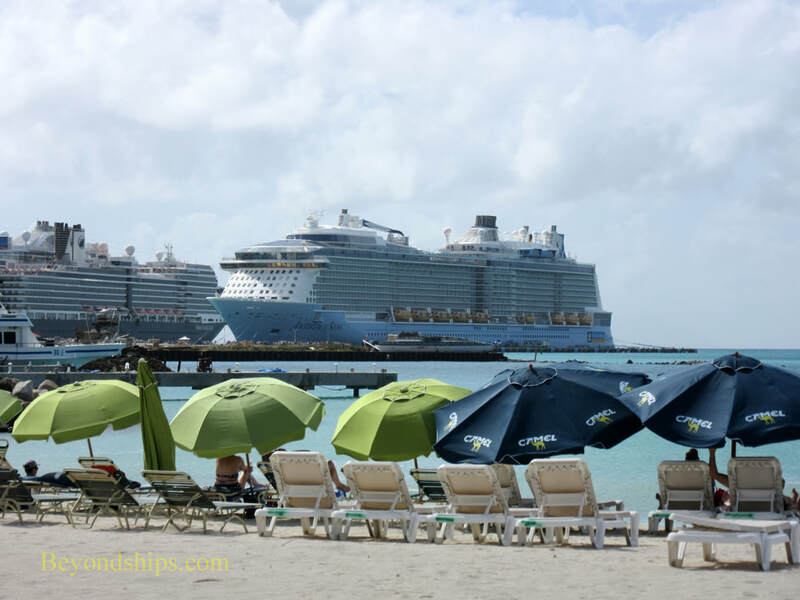 Most cruise ships calling at the island dock at the JC Wately Cruise and Cargro Facility outiside of Philipsburg on the Dutch side of the island. Both of the facility's two large concrete piers were in operation during our visit in January 2018. Regal Princess and Eurodam were docked at one and Anthem of the Seas docked at the other. This was fewer than the number that typically call at St. Maarten but these were all first tier cruise ships representing leading cruise lines. Next to the piers is a cruise village with shops and cafes. All of these appeared to be in operation. Indeed, some of the shops that were in two buildings that had been under contsruction when I visited last Spring were now open for business. Linking the cruise village to downtown Philipsburg is a water taxi. This was in operation. An alternative way of getting to downtown is to walk. The sidewalk that runs along the road is bordered for part of the way by tall palm trees. In the past, these trees had shaded the sidewalk. However, the storm stripped them of their long palms and now there is only short new growth at the top of the trunks. This was generally the case throughout the island. 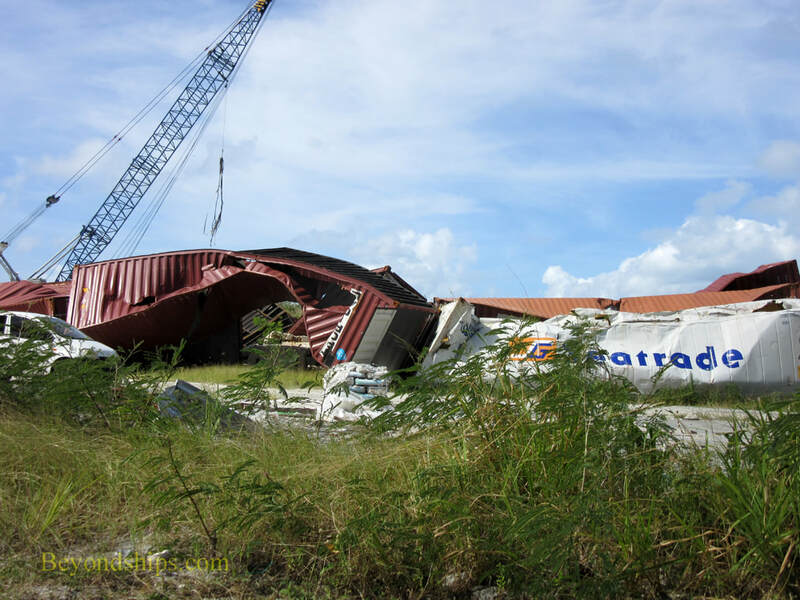 Further along the road, the remains of cargo containers had been piled up in a vacant lot. Twisted and bent, they were hard evidence of the strength of the storm. In the past, a cutout of a woman in a bikini marked the place where you leave the road in order to get to the boardwalk that runs along in front of downtown. The sign is now missing so you just have to remember to turn at the parking lot for Bobby's Marina. The boat yard by the parking lot appeared busy. However, there seemed to be fewer pleasure craft at the marina and out in the Great Bay than I remembered. The “boardwalk” is actually made of concrete and so was not damaged in the storm. Most of the shops and cafes along this area were in operation. Great Bay Beach was also in operation with vendors renting sun loungers and umbrellas. 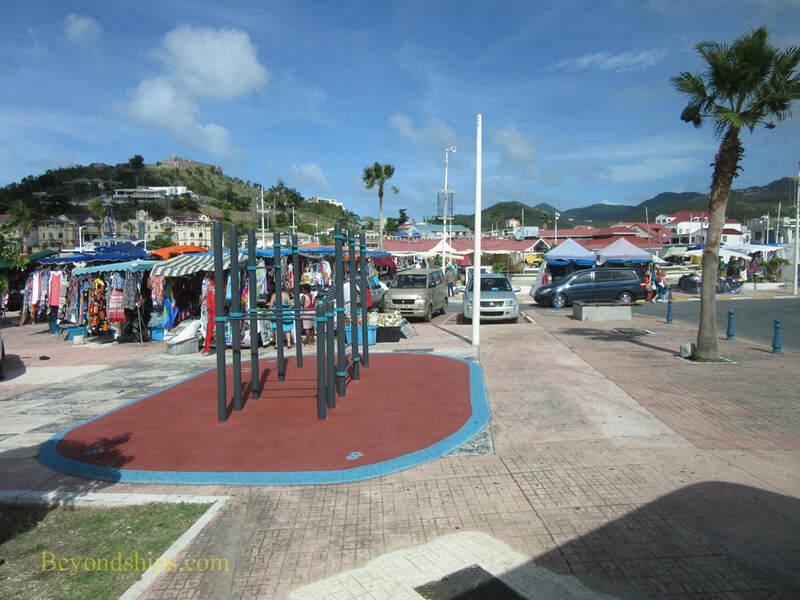 Going inland, Philipsburg's main shopping area is along Front Street and the small streets running off from it. Several of the buildings showed signs of storm damage, especially on the upper levels. However, many of the shops along these streets were in operation but some remained boarded up. Throughout downtown there seemed to be construction going on. 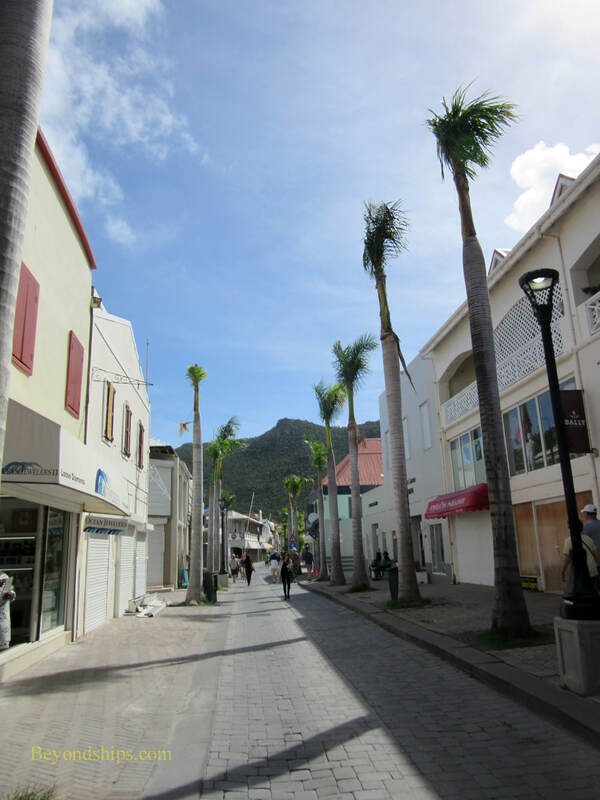 While much of the shopping area has been pedestrianized, the roads around Philipsburg typically have a lot of traffic. This is still the case. It is a busy place. In order to see how the storm had affected the rest of the island, I took the gneral rour of the island offered by the ship's shore excursion office. Although this tour took us up the eastern side of the island into French St. Martin, we did not visit Orient Bay, the most famous of the island's 36 beaches. The shore excursions staff told me that there had been widespread destruction at Orient Bay and many of the facilities were still closed. The tour guide agreed saying that reconstruction was still underway. As we drove through the eastern side of the island, we could see collapsed commerical buildings. There were also residences having new concrete roofs added to replace steel ones. It seems that metal roofs are able to withstand the wind and rain but not being hit by objects such as flying cargo containers. Marigot, the capital of the French side of the island, is known for its European charm with its open air market, sidewalk cafes and upmarket shops. The open air market still flourishes by the seaside and there are still some sidewalk cafes and shops. However, there seemed to be fewer cafes and shops than before. Quite a few commercial facilities were closed and there was more overt storm damage to the buildings than in Philipsburg. Returning to the Dutch part of the island, the western part of the island around the airport is the most commercially developed. Damage was less obvious here. But as in Philipsburg, there were fewer pleasure craft in Simpson's Bay than usual although there were several magnificent large yachts. 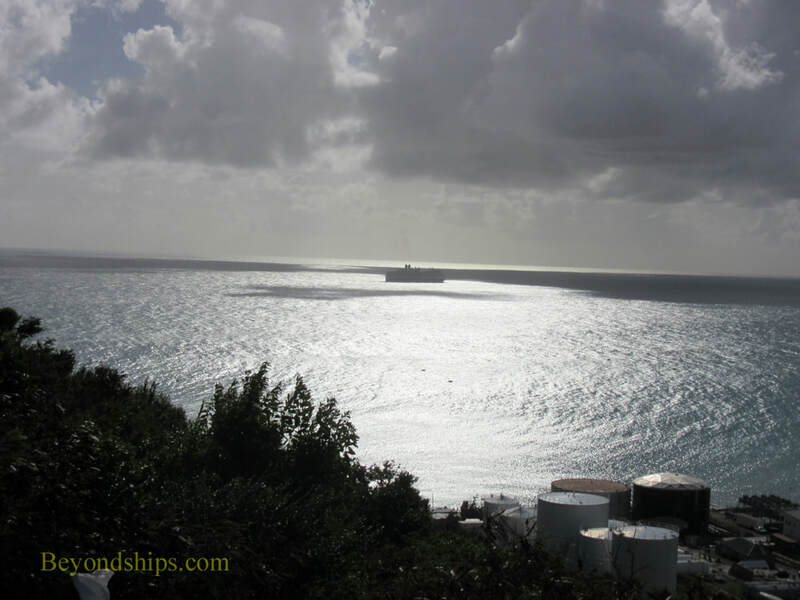 One of the island's best known attractions is Maho Beach. A small beach, its big attraction is the fact that airplanes landing at the airport fly low over the beach. In any event, Maho is back in operation. In sum, the island was hard hit by the 2017 hurricanes. However, it has bunced back a long way in a short time. Many of its shops are open. In addition, many of its tourist attractions are in operation. As a result, the island is once again an attractive tourist destination. Above: Ruptured cargo containers show the power of the storm. 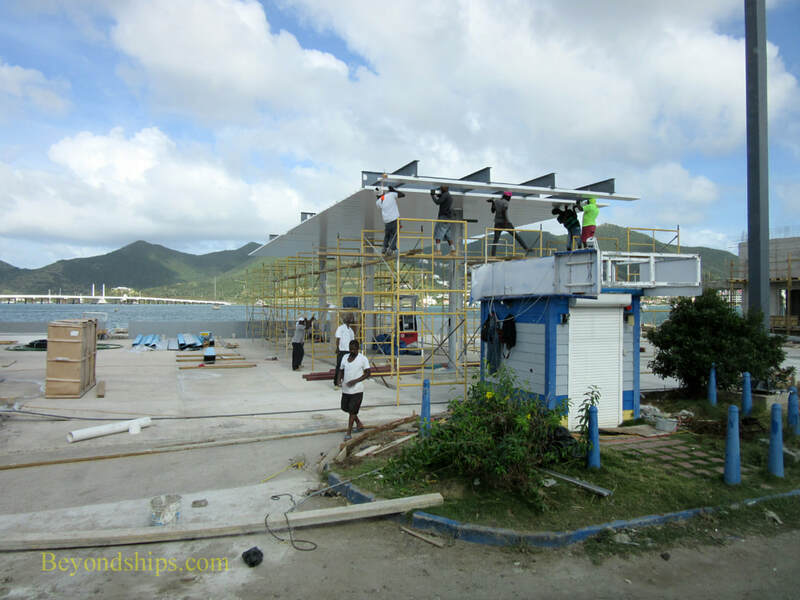 Below: Reconstruction and construction are taking place across the island. Below: Front Street in Philipsburg. 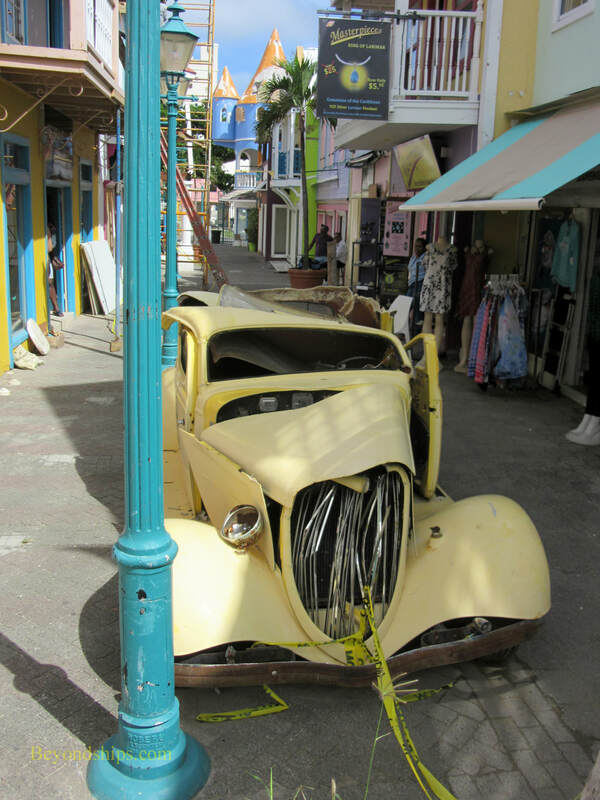 Above: Although many shops have re-opened, the damage to this classic car landmark shows Philipsburg's shopping area was not exempt. ​Below: The open air market in Marigot on the French side of the island.